After what I saw today I can say that I am now a Keith Wenning fan. The BSU QB showed style throwing for 24/30 for 324 yards and 3 tds. By no means does that exonerate the defense nor forgive the penalties. Moving on. To the next challenge. Your Ball State/Army story, stats and highlights. There's a link up under the Radio tab above, this one has been hit or miss this year, so I'll try to stay astride of a fresh link to Army Ball State. Case Western has a selection of their yearbooks online, and this is another look at a swell set of online yearbooks. These yearbooks all represent years before Case Institute and Western Reserve combined powers to become Case Western Reserve, so some of the years have more than one yearbook. That also explains the variety of names that the Case Western Reserve yearbooks printed; there was Reserve (Western R.), Differential (Case), Nihon (Western), My Diary, Eos (Western R.), Polychronicon, and Lux. There are a few yearbooks for sister schools involved, but this is a great look at Case Western's history. The years that are available online are, 1913, 1914, 1922, 1924, 1926, 1927, 1933, 1945, 1947, 1949, 1950, 1951, 1953, 1954, 1955, 1958, 1959, 1962, 1963. 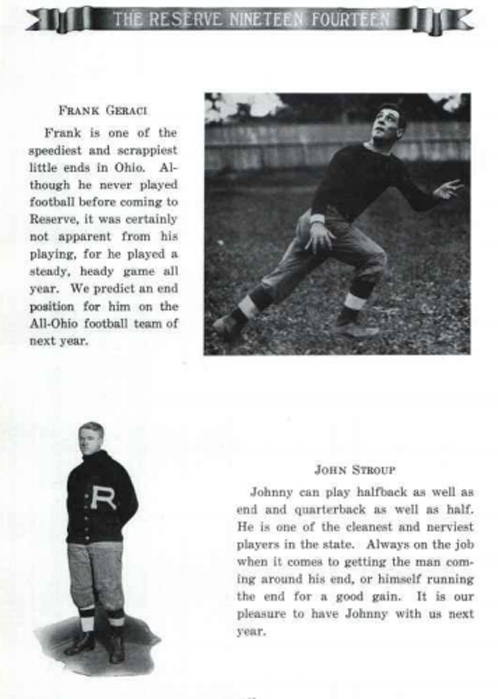 These yearbooks give a nice look at a quaint early football club. 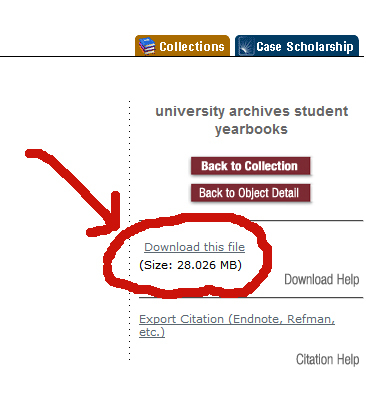 My only beef is the confusing system they use to download and view yearbooks. 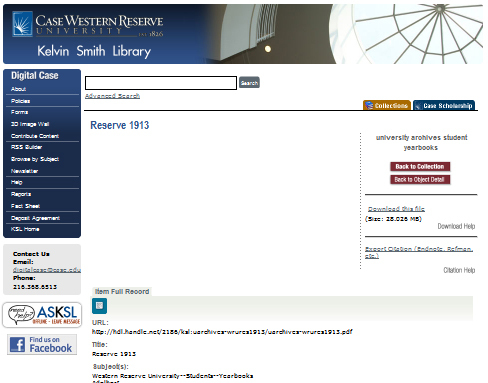 Each year from the Case Western Reserve yearbook list opens up to the school's online library catalog. That is just fine by me, but the active 856 MARC field only opens up to the expanded detail catalog page. The link to each PDF is on the right side toolbar which looks something like this. There shouldn't be any questions about where to find Case Western's online yearbooks nor should there be any doubts about my knowledge of X's and O's after that last photo. Either way, use that knowledge to set adrift on past memories of Case Western Reserve. Pitt is my alma mater and easily my favorite college football team, so of course the move to their move to the ACC (and the pending breakup of the Big East) is on my mind. If Pitt got screwed like the Big East at large I would probably be losing my hair about the situation. Duke, NC State, Virginia,Wake Forest, UNC, Clemson and FSU. That is a nice eastern football league, it's Joe Paterno's All-Eastern-Sports-League without Penn State. It's a dream scenario. Likewise, Rutgers, UConn, USF, Louisville, Cincinnati: need not apply. "UConn, and probably Rutgers, would complete an eight-team Northern Division that would keep the school in a cluster or East Coast and Northeast teams, so travel costs and time away from classes would be easier across all sports. The ACC would provide major upgrades in competition and national profile in some sports, especially football and baseball. and goes on to place Uconn and Rutgers in a Northern Division with the Old Big East. UConn,& Rutgers, yinz ever feel like dead weight? Pitt Blather has been a pretty good gauge of the situation over the months, but now that Pitt are party to the defections it kind of seems like other teams and blogs will have a vested interest in the expansion fallout. I used to be in that boat, so it is tough to watch old conference-mates squirm. The new ones? ok... that's a bit more fun. Understandably there is bitterness all around, at the departing teams, at the conference head and at the ACC. As far as the Big East football schools go, it's been real. We all had our differences, but at the end of the day, everybody each shared the same common goal, the same collective chip on their shoulder. They had a good run, and it doesn't matter what some yahoo sitting in a cornfield thinks. They proved that they belonged beyond a shadow of the doubt, and if not for internal, self-inflicted sabotage, Eastern football would be a force to be reckoned with to this very day instead of being about to enter hospice care. Those bastards killed it, and the remaining Big East football refugees should spare no act of spite or retribution to make them pay for their multitude of crimes. Enjoy playing in the new Atlantic Ten. You've earned it. It's not that Syracuse and Pittsburgh are irreplaceable on the gridiron. They're not, and Big XII remnants like Missouri could easily pick up the slack in that respect. To Pitt and Syracuse's conference mates; I can only wish yinz the best of luck if that is the direction you choose to go. Army's offense is humming along now, and if this is Trent Steelman dinged up, a healthy Steelman would be superhuman. #8 had a game high 28 rushes for 108 yards, but more importantly showed a command of the offense that speaks to his experience under center. The offense turned in a very sharp performance and not only iced the game on defense, but scored late when they needed to. It was just about as good a showing as you could hope for. Northwestern fans seem to be taking the loss alright, throwing in the towel considering the team had a ton of self-inflicted wounds. Danny Wild has a truckload of pictures from the game; looking at those pics is already the highlight of my week. 21-14 is a great way to get 2011's first win. Next up is Ball State and a chance to even the record on the road. Here's your Army/Northwestern Story, Stats and Highlights. I feel pretty good about this week's ballot. I might have switched the likes of Washington State for an Iowa State, but I'm pretty sure I'll have the chance to add Washington St. next week.